Do you feel the pain already? No? Get a loan, buy that car you always dreamed of, get some jewelry for your wife, go for an extended vacation overseas and enjoy a two star molecular dinner and better go for it now because it might b the last time for a while. My hunch is that the current crisis on the U.S. housing market and the credit crunch will bite the German economy. Not now. Later. CNN Business editor Todd Benjamin has been predicting recession and rising oil prices for a while, and Jack Cafferty has asked CNN viewers „What’s the difference between a “mental” recession and a real one?“ A brief look into the media raises fears that the U.S. economy has more gloomy days ahead, e.g. NYT1, NYT2, IHT1, Atlantic, Business Week, FT1, FT2, IHT2, Le Monde, NZZ, FAZ, SPIEGEL, Handelsblatt. Socioblogger Dan Hirschman has already layed the foundations [some thoughts on the mortgage crisis; a follow-up on the mortgage crisis], so why follow the U.S credit monster any further? Why disturb the happiness since German business leaders, politicians and financial analysts prefer to discuss the crisis only in very moderate tones? Like Dan, I am not an economist, so I also draw on a different toolbox. My focus is on the structural and cultural change in companies – especially the public banking sector – in Deutschland AG (Germany Inc) and the consequences in the face of this development. For more than 40 years, German companies have profited from a very specific strategy vis-à-vis an emerging global economy: a strong technological orientation, high quality orientation with regard to products and processes and incremental innovation of making small changes in products and processes rather than radical innovation of seeking opportunity in fundamentally new technologies, business sectors or world markets. German companies would spread risks broadly by engaging in various activities simultaneously and not limit their activities to few profitable activities. Thus they were able to maintain their niche by exporting products characterized by strong technological specialization. The business environment where this strategy worked out fine for decades was „Deutschland AG“ – a network of financial relations and interlocking directorates among Germanys large industry companies, banks and insurance companies. Deutschland AG emerged as a strong coherent organizational field with two companies at the core: Deutsche Bank AG and Allianz AG. Since the mid 1990s, though, we witness the dissolution of Deutschland AG. 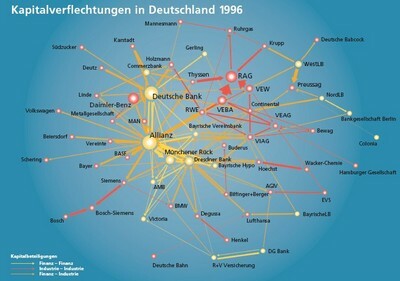 That is, the number and intensity of interrelations of mutual shares and interlocking directorates is declining and German companies show a stronger orientation toward the global financial markets rather than seeking shelter in the established network relations of Deutschland AG. Referring to the various writings of Wolfgang Streeck, Martin Höpner and Jürgen Beyer and to my dissertation it is safe enough to say that core companies of former Deutschland AG such as Deutsche Bank, Allianz and subsequently many other players in the German finance sector saw greater business opportunities in a strategy shift – to withdraw from the boards of the various companies, to enter the global investment sector and to benefit from the dynamics in the organizational field of global capital markets because a flourishing global financial market opens the door to much more capital. Investment money from diverse sources on global capital markets comes at the prize of a small size of German companies as compared to the largest players on global organizational fields, e.g. finance, chemistry, pharmaceuticals etc. As these graphs by Lothar Krempel at MPIfG show, Deutschland AG has been declining since the mid 1990s to the present day based on the data from the Monopolkommission (German anti trust commission). 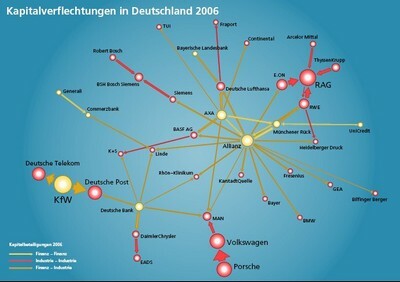 Whereas graphs in blue show the decline in financial relations, the graph in gray shows the network of interlocking directorates in Deutschland AG for the year 2006 [MPIfG document here]. 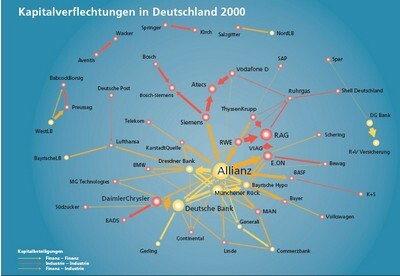 State-owned banks traditionally play a special institutional role in German corporate capitalism. They were established to provide economic development with the recources necessary and contribute to a sound business development with long term orientation. One of the few remaining nodes is Kreditanstalt für Wiederaufbau. KfW, originally established on the basis of the Marshall plan in 1948, is a state-owned development bank designed to assist the German economy and developing countries. The bank lends to small and midsized German businesses and buys securitized small and midsized business loan portfolios from German banks in order to keep that area of lending robust. KfW also provides funds for housing, infrastructure, environmental protection and preservation, and venture capital. KfW has adopted a global stategy in recent years. Deutsche Industriebank (IKB), located in Düsseldorf, was founded 1973, is also specialized in lending to small and medium sized companies to foster German economic development. In August of 2007, IKB became the first victim of the U.S. credit crunch in the housing business since a 100 percent IKB owned company named Rineland Funding Capital Corporation (RFCC) as a result of extensive speculation on the US subprime mortgage market. The essence is that IKB was refinanced by state-owned KfW: While it is expectable and legitimate that German banks engage in the U.S. mortgage market and will be held accountable for their expected writedows, IKB was rescued by German tax payers payers money after Rineland Funding Capital Corporation (RFCC) had extensively lost on US. subprime mortgages. The future of IKB still remains uncertain [FAZ2; FAZ3; PR inside].